Card companies take a percentage of sales from stations. As gas prices continue to soar, consumers may have to bear more of the costs. Credit cards are eating into gas stations' profits, and the cost may be the consumer's to bear. NEW YORK (CNNMoney.com) -- Buying gasoline with a credit card could be hurting your local independent gas station owner - and you may have to pay for it. That's because credit cards charge merchant fees in the form of a percentage of sales - and those fees eat into the fixed per-gallon sum that gas retailers tack onto pump prices. Some stations raise prices in order to keep profit steady. But others are unwilling to risk the competitive disadvantage or unable due to contracts with suppliers, and absorb the hit. "In some instances, this credit card problem is turning to the straw that broke the camel's back," said Paul Fiore, vice president of Service Station Dealers of America and Allied Trades. Fiore said gas station closings are not yet wide-spread, but could turn into a bigger problem as gas prices continue to increase. In turn, Fiore said fewer gas stations could mean less competition, perhaps leading to higher gas prices for consumers - although he said he hasn't seen that happen yet. In the first quarter of 2008, retailers added an average of just under 9 cents per gallon of gasoline on top of their costs. But credit cards and issuing banks charge merchants a total of about 2% per purchase. That may have been more manageable when gasoline was around $2 or $2.50 a gallon. But with gas prices soaring to a national average of $3.76 Wednesday, according to motorist group AAA, those credit card fees add up to an average of 7.5 cents per gallon - taking away nearly 83% of gas stations' fuel profits. And different cards charge different rates. 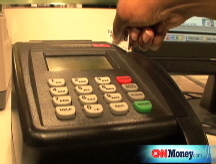 Debit cards charge merchants an average of 1.5% plus a 10 cent flat fee. But premium cards, which offer welcome cash-back or other rewards to users paying surging gas prices, charge the stations as much as 3%. "It's an oppressive system," said Bill Douglass, owner of 15 gas stations in Texas and CEO of a company that services and sells products to 150 gas stations. Not only do cards charge a variety of rates, but some retailers get charged different rates than others. "The rate credit card companies charge depends on the gas station's volume of sales," said Lowcards.com chief executive Bill Hardekopf. "Joe's gas station won't get the same rate deal that a national retailer does." Credit card company Visa Inc (V). said Big Oil is to blame for high merchant rates. "The cost of accepting card payments for service stations is generally set by the large oil companies, which negotiate a merchant discount with their financial institutions, and then in turn mark up the merchant discount to charge their franchisees," the company said in a statement issued to CNNMoney.com. "The merchant discount is not set by Visa." The Electronic Payment Coalition (EPC), a group representing credit card networks and financial services organizations, said it's impractical for card companies to negotiate with every single gas retailer. So, it said, gas station owners should put pressure on their parent oil companies to negotiate a better fee. Independent gas retailers may bear a Big Oil company's name, but station owners do not receive incentive payments or allowances from the oil companies. Gas station owners with deeper pockets can also afford to compete for drivers by lowering their prices to the point that they don't profit at all from gas revenue. About 80% of gas stations include convenience stores and, with rising credit card rates, station owners make nearly all their profit from the drinks, snacks and newspapers inside the store, not on fuel. Appearing before the House Judiciary Committee last week, Douglass testified that consumers are willing to drive an extra 10 minutes to save just 3 cents on a gallon of gas, putting added pressure on independent retailers. "Wal-Mart and Costco choose to sell below costs down to bring in traffic, but we have to have a product that at least breaks even," he said. That means that some gas retailers that are unable to compete are forced to close down - especially those that do not have an attached convenience store to remain profitable. Visa said that offering the ability to allow customers to pay for gasoline with a credit card is actually beneficial to the retailer. "Visa believes that the cost of accepting card payments is more than offset by the tangible benefits to stations and their customers, such as the ability to pay at the pump," said the credit card company. "Visa values our long-standing partnerships with service stations - a relationship that has helped drive their business and increase sales by maintaining a convenient, reliable and secure payments network." As credit card use has now become standardized, retailers don't have much choice but to accept the rate and take a hit to their profits rather than offer a two-tier paying structure. "Very few retailers will charge more for credit cards, because they're such a big part of society," said Hardekopf. But Congress has noticed, and is proposing action. Rep. John Conyers, D-Mich, and Rep. Chris Cannon, R-Utah, proposed the Credit Card Fair Fee Act to the House in March. If passed, the legislation would issue controls on rates charged to merchants. Some think that price controls are an affront to free markets, and it is dubious that retailers would pass their savings onto consumers. "It's a little bit preposterous," said EPC spokeswoman Trisha Wexler. "They're going to take the profits for themselves." But Douglass said that lower rates would allow him the ability to compete with bigger gas stations that are selling gas below costs. "Ultimately, we think we can lower the price to the consumer if we can negotiate with the credit card companies," said Douglass.